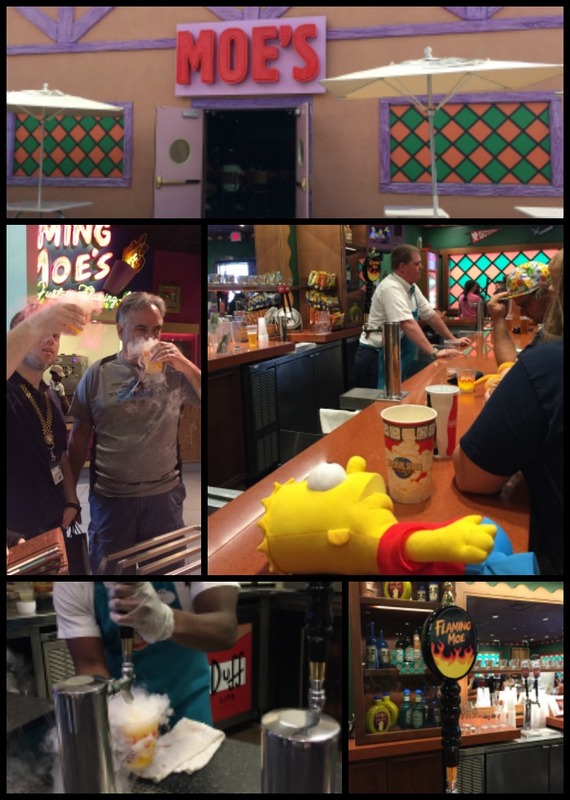 My Journey to Fit: Orlando Part III - The Simpsons! Orlando Part III - The Simpsons! 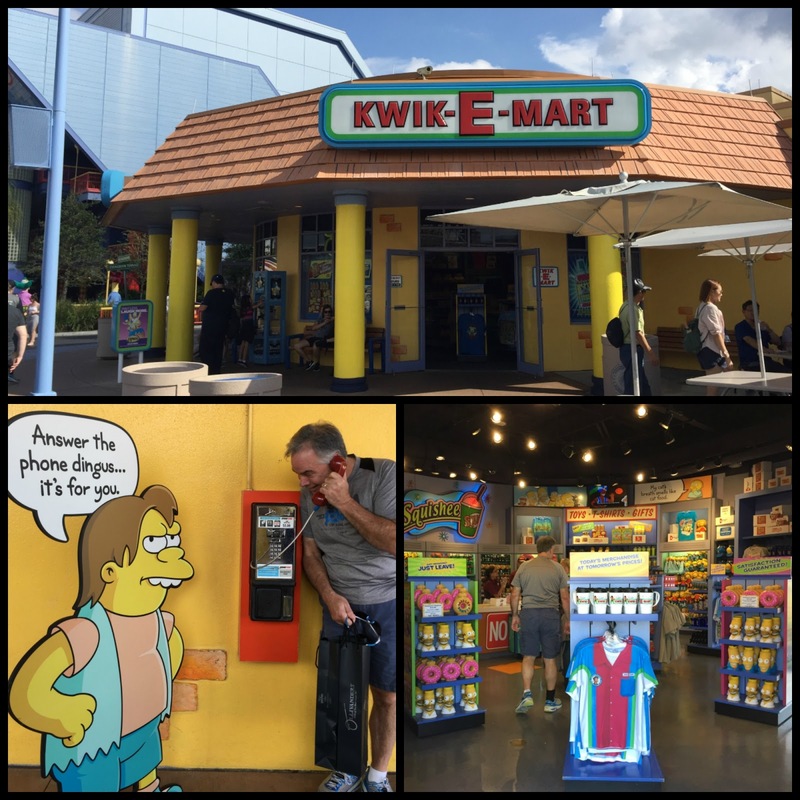 After all things Harry Potter, the next thing I was most looking forward to was visiting Springfield, home of the Simpsons, in Universal Studios. Jeff and I started watching Homer, Marge and the gang back in 1987, when they were on the Tracey Ullman show as one-minute shorts. It was my kind of humor - and my kids, as well...we probably let them begin watching The Simpsons at way too young of an age, but I credit that show with helping to develop their sense of humor, so it's all good. If you stood near the phone, it would ring and Apu would tell you to stop loitering outside of his store - it was fun to be insulted by a cartoon character, as you can see how Jeff is laughing as he listened. I thought it was funny to see a Bart doll lying on the bar counter. Jeff, Sam, and Allie tried a Flaming Moe - it's made in a special cup with dry ice to create the boiling effect. They coughed their way through drinking it - it's not easy to drink liquid and vapor at the same time, apparently. Still, an experience that had to happen. 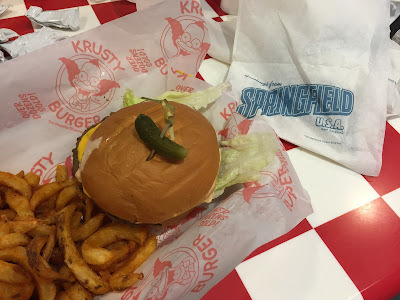 Not the greatest burger I've ever had, but again, an experience - I got to eat at Krusty Burger! 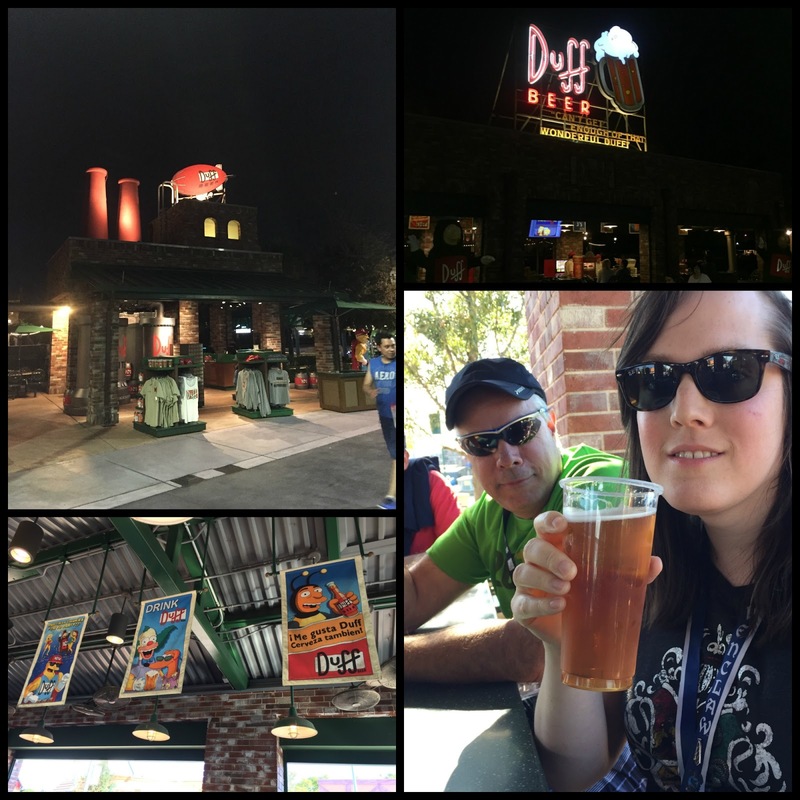 Jeff and Allie had a Duff beer, while Sam had a Squishee with alcohol. I had a cup of ice water - and I should point out that Universal Parks were great about giving cups of water everywhere, at no charge. It was nice to get a cup of water (amidst all the butterbeer, LOL) without having to pay theme park prices for a bottle of water. They had carnival games you could play (these cost extra), with stuffed Simpsons characters as prizes. 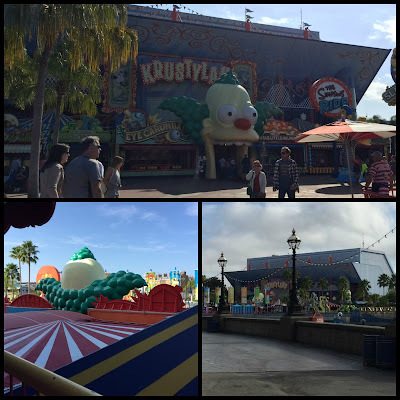 To go on the Simpsons ride, you entered the line through Krusty's mouth. 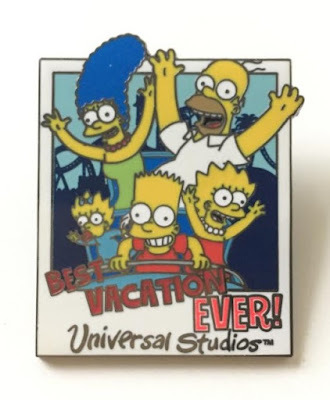 This ride was one of our favorites and we went on it many times - it was really fun, fast-moving, and again, in that theme-park-within-a-theme-park, you went on a roller-coaster ride with Bart, Lisa, Marge and Homer. So many things about that ride stayed with me, but my favorite was a quick glimpse of Ralph Wiggum being flown through the air, saying "I'm a baby bird!" - again, if you're a fan of The Simpsons, this ride would be totally IT for you. We meant to get one of their giant pink-frosted donuts to share, but never ended up doing so - I think we were usually sugared-out by all the butterbeer and that donut would have put us over the top...apparently we had limits to our indulgences! They were great - we all were hugging them and it was ridiculously thrilling. What can I say, we LOVE The Simpsons! The lighting was a little funky so I put a cartoon filter on the picture. I'm so glad we got to meet all of the main characters from the show - I think you can tell by our smiles that this was a highlight of our trip. I have enjoyed reading your vacation review of the Universal theme parks. Even though I live in Orlando I have never been to the parks nor do I plan to go ever. A lot of us natives have no love for any of the theme parks especially me having worked for two of the major ones back in the 80's. I can imagine what it's like to live in Orlando, based on how I feel when there are home football games at our local university. The visitors are necessary for our economy, but oh how they mess up traffic, etc! How fun! I wish we had more time to explore the Simpson section of Universal last time we were there but it was getting late so we just walked right pass. Love the character photo with you all! Haha! I never knew this place existed. My youngest son was raised on the Simpsons and would love this! Oh man the Simpsons! My kids love them still!! Okay, can you believe I have never seen one episode of the Simpsons?? Knowing that I like your sense of humor makes me want to start watching them! I wonder if they're on Hulu? 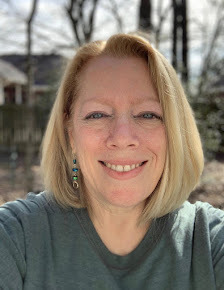 Anyway, another fun report! OMG, I had NO IDEA there was a Simpson theme park! Doh! Thanks for the vicarious adventure, sounds like a blast. LOL! What a blast!!! I'm surprised the phone doesn't have Moe's voice saying "ask if Hugh G. Rection" is here. HA! That line never gets old!! Their quotes are a normal part of our language! While I've never been to Universal Studios, I do love reading about it! This sounds like a neat area! So much fun! I never really watched the Simpsons, only saw an episode now and then but if you are a fan like you guys are, this is definitely a must do. So happy you had such a great trip and I kind of had too because I enjoyed every post you wrote about it. Aww, I love love love the family pic with all the characters! This makes me want to watch the show again. I haven't seen it since I lived at home!!! And that is great you could get water anywhere you went for free!